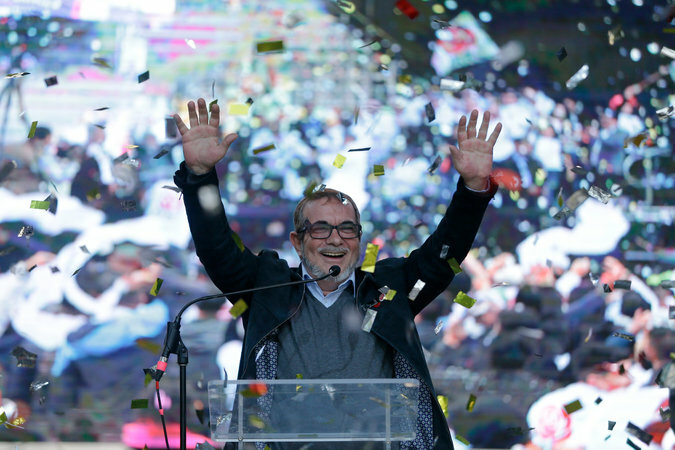 Mr. Londoño campaigning in Bogota last month. Mrs. Daza singled out the hard-line Democratic Center party for the most recent violence. The group’s spiritual leader and Colombia’s former president, Álvaro Uribe, has been a fierce critic of the peace process. During Mr. Uribe’s tenure in the seat Mr. Londoño hopes to occupy, he led a brutal military campaign against the FARC. After his presidency, he led the successful effort to vote down the peace deal in an initial referendum in October 2016. The deal was ultimately passed in November 2016 by lawmakers. The FARC’s decision to suspend its campaign, in which it is running 74 candidates across both houses of congress, is a dispiriting moment in a peace process that struggles to maintain public support. The government was considering these elections an indicator of the peace process’s success. Mr. Londoño was running on an anti-poverty platform, having begun his presidential bid late last month in a downtrodden Bogotá neighborhood. Bespectacled and wearing a suit and tie — a far cry from the jungle fatigues he once donned — his campaign represented the group’s willingness to move from armed struggle to the political arena. Still, many Colombians are unable to look past the wartime atrocities he is accused of overseeing. A faction of society still considers him a terrorist, and wants him to answer for his role in a half-century-long conflict that left at least 220,000 dead and nearly seven million displaced. President Juan Manuel Santos of Colombia, who oversaw the peace deal, called on the country to resist political violence.